Find My Workspace lists over 95% of the serviced offices & coworking space market in Cheung Sha Wan. Simply click Request Quote to check pricing for one office, or Add to Basket for multiple offices. 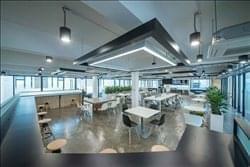 The center founded by entrepreneurial enthusiasts, is a co-working and serviced office space that connects business and tech talents, while nurturing startups to grow from 0 to 1 and offering a true co-working experience. The community consist of entrepreneurs, web/app developers, consultants as well as data architects, digital marketers, social media specialists and designers. The center offers hot-desking, co-working, serviced offices and event space, meaning there is an option for everyone. This space has an abundance of amenities, including; green workspaces, free wi-fi, lockers, standing workdesks, coffee machines, brainstorming labs, scanning and printing facilities, and 24/7 access, plus at the end of a hard day you can escape to the rooftop terrace for a breath of fresh air. To obtain information for your selected Cheung Sha Wan Serviced Offices & Coworking Space, please tick the "Add to basket" box for each office you prefer and complete the form below. We will then send a detailed report via email.